Whew! The Brandau family has had a fantastic few days. It started with the wedding of my baby brother Travis and his girl Angie. They had a beautiful wedding! I barely took any photos the entire weekend, but the photographer has released a few that look amazing! Congrats to both of you!!! Angie and Travis asked all of the cousins to be in the wedding, so here are the few photos I took of my adorable children. The next day was a whirlwind. We drove home to our apartment, packed up the rest of our suitcases, and made it to the airport with the help of some very patient friends (Thanks Whit and Abby!). My Mom kindly offered to finish cleaning up things like my kitchen. So far, I think we've only thought of three things we've forgotten! We were worried about a tight connection in Denver. We landed in Colorado and I ran off with the kids while Tom waited for our two bags that had to be gate-checked. Luckily, the flight was delayed slightly and Tom made the connection with time to spare! We learned what's important to take on the plane (gummy worms and a fully charged iPad for each kid!) and even experienced boarding and then getting off a plane with a soundly sleeping 3-year old. The kiddos are watching the first plane arrive. The kids were rock stars on the flights. Theo had one very small meltdown during the last hour of our 24 hour trip when I poured his milk on his cereal "wrong" and we needed one bandaid before boarding the first plane. Otherwise, we were amazingly mishap free. Really, the trip couldn't have gone better! We checked into a hotel to help with the transition as we get our home here ready. Tom leaves this afternoon for a quick trip to Thailand, so this way I don't have to worry about getting household items and food right away. 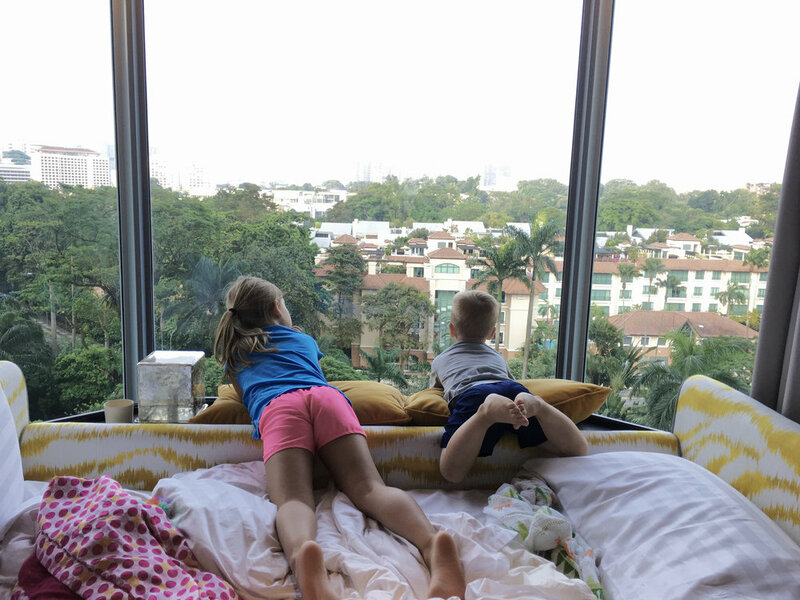 The kiddos are looking out the hotel window at the view! Yesterday we took possession of our home, got our minivan that we will be driving here, Tom got a local phone, and we explored a park near our home. The kids ate their first meal in Singapore, which, ironically, (due to some time constraints) was McDonalds. It's amazingly like McDonalds at home. There are a few differences, like the size of the drinks, corn on the kids menu, and durian McFlurrys. Durian is a local fruit that is supposed to smell horrific. It smells so bad they don't allow them on the MRT (train system). No, I didn't try one. Amelia testing out our new ride. We explored a park near our home and the kiddos loved it! Here's a video I took of Amelia. Tom drove in Singapore, where everything is backwards! (I'm not quite ready to take that on yet!) After the park, the kids passed out and we had to carry them to our hotel room. They woke up at 4:30 this morning all bright and cheery ready to tackle today. Today is all about relaxing and helping the kids adjust to the 13 hour time difference. Thanks for all your thoughts and prayers as we take on this new adventure!